The Phoenix Mini Max features a 42-inch tall entry door (see below). To enter or exit the camper, you simply bend down. This can take some getting used to, but should quickly become second nature. At 6’3” tall, I was going in and out of the Phoenix all day during the photo shoot and review analysis – without issue. 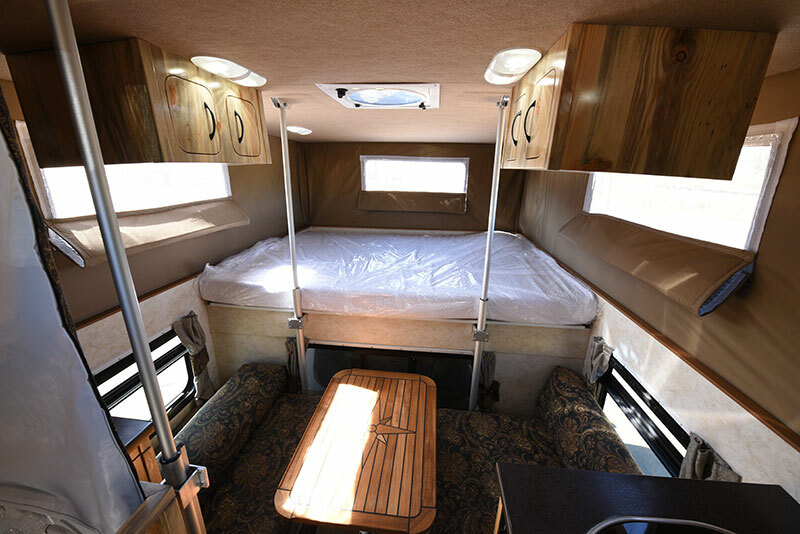 While you’re looking at the above photograph, note the standard 8-foot Carefree Freedom III side awning, cassette toilet door, and water heater on the driver’s side and driver’s side rear. For entry steps, Phoenix recommends an inexpensive and lightweight step stool, but scissor steps are also available. Lift-Up Basement Storage Nook? Yes, Please! Immediately inside the Mini Max entry door is something we have never seen before; a lift-up basement storage area. This is a wonderfully convenient spot for storing flashlights, dog leashes, umbrellas, and other outdoor items. The metal banding in this area is quite attractive, but the corner that protrudes at the front of the entry way and at the front of the lift-up basement door are quite sharp. Considering that this is a high traffic area, these sharp corners should ideally be covered in a soft plastic, or otherwise de-sharpened. Lift up the basement storage area and there’s a nice amount of storage space. The design sensibility and attention to detail here is fantastic. 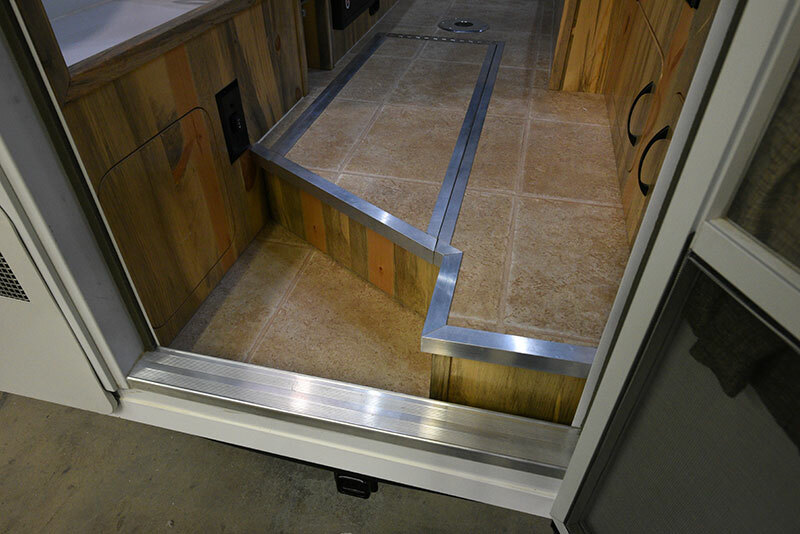 We have often wondered why hard side truck camper manufacturers haven’t attempted basement storage access doors. Lift up basement storage nooks? Yes, please! The black and white crank shown in the basement storage area is for the standard awning. 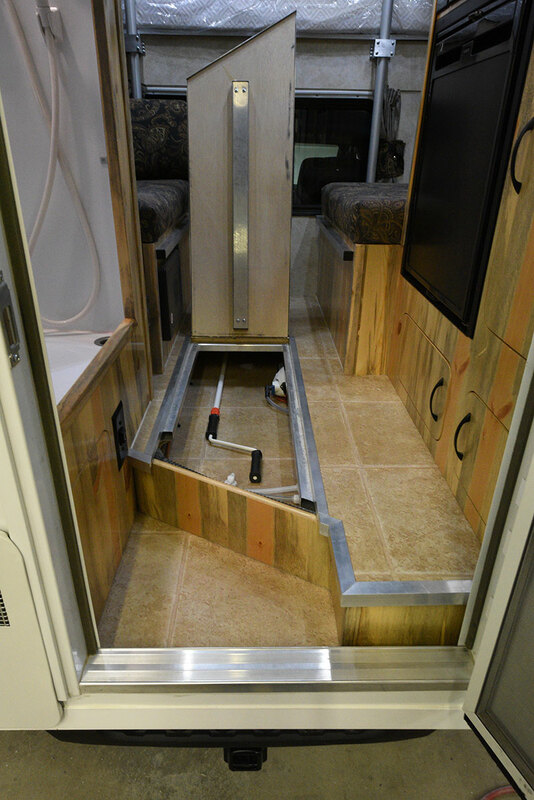 You can also see the aluminum framing employed by Phoenix Campers in this photo (and below). This photograph was taken inside the basement storage area and shows the plumbing, copper, and electrical lines that run through this space. While not the neatest presentation we’ve ever seen, the lines are well secured for off-road durability. If you do place objects in this storage area, you will need to be careful about anything that could impact these lines. I prefer to see these lines enclosed and protected in their own box/channel leaving the storage space open for storage of lose items. This image was taken immediately inside the entry door, standing up, and facing towards the front of the camper. Just out of frame is the kitchen on the passenger’s side (right) and the wet bath on the driver’s side (left). Forward of these two features is a face-to-face mid-dinette, and then the cabover bedroom with a queen-size mattress. Standing at the doorway, it’s remarkable to see how much utility and comfort Phoenix has squeezed onto the back of a mid-size short bed truck. This is what they meant by Mini Max. Turning toward the passenger’s side we find the kitchen. Phoenix employs a solid surface material called Staron for their counter tops. It’s a similar acrylic material to DuPont’s Corian, but made by Samsung. When you order a Mini Max, you pick the Staron color you want, along with an interior fabric. 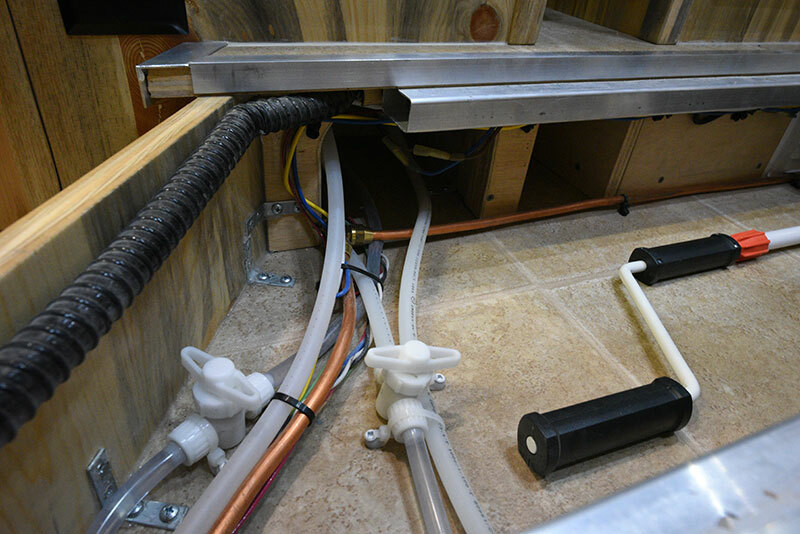 Since the Mini Max targets mid-size and full-size short bed trucks, it might make sense to install a lighter weight counter top material. Mid-size trucks are notorious for their relatively anemic payload capacities; especially compared to heavy-duty three-quarter and one-ton trucks. Fortunately, Phoenix would be more than happy to use a lighter weight counter top material, if that’s what you need. 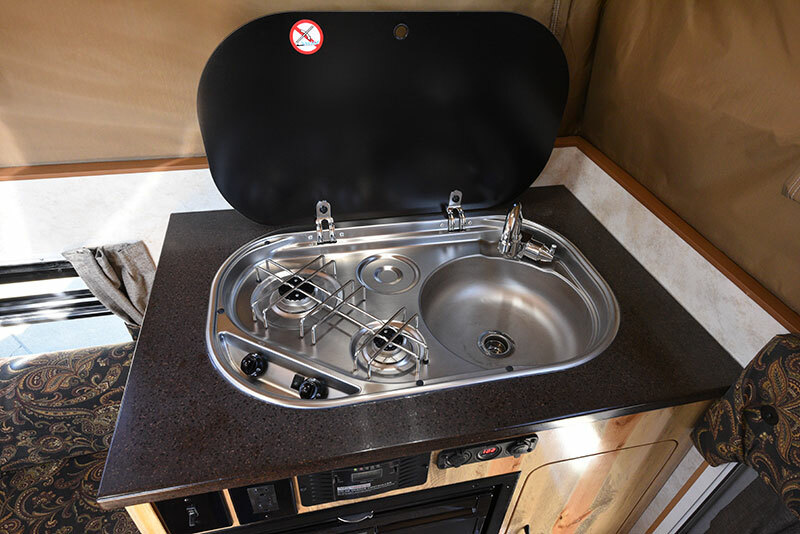 The combination two-burner and sink in the Mini Max is a model of maximum function in a minimal space. It’s as if this unit was made specifically for the Mini Max, or was it the other way around? 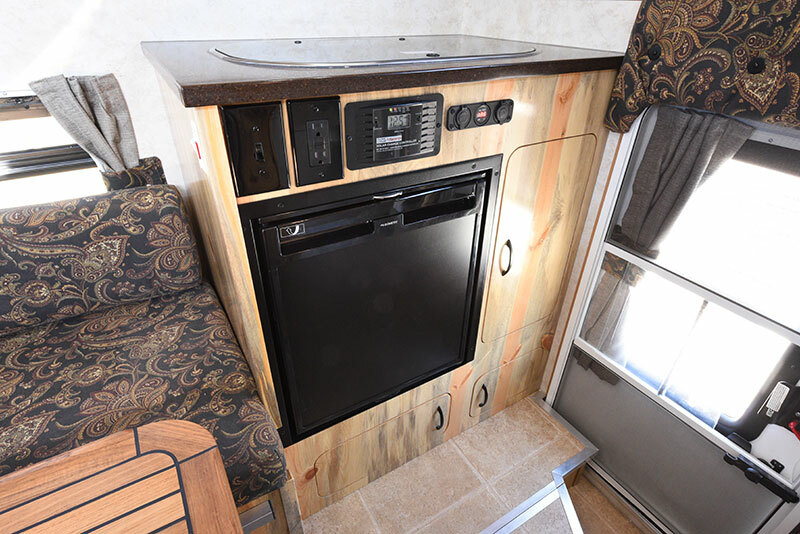 I can see Robby holding this combination stove-sink and saying, “We could make a really cool camper with this”. I tried to imagine what it would be like to prepare food and wash dishes with this kitchen set-up. 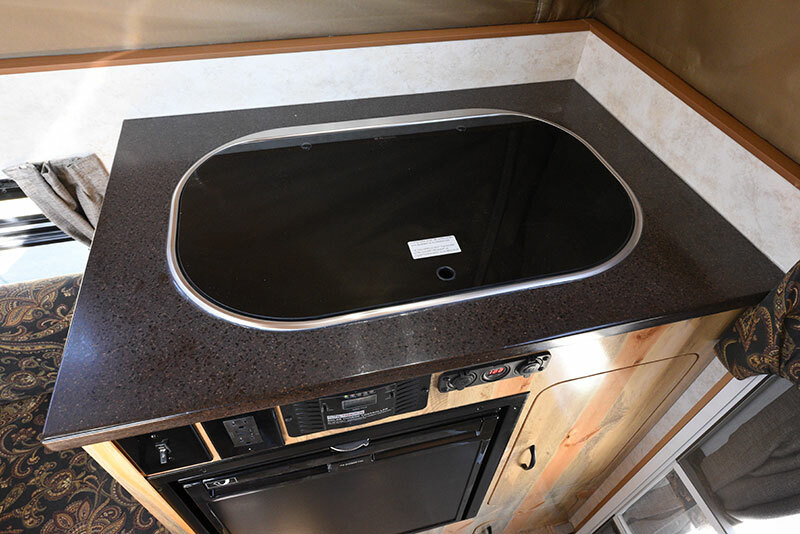 In our much larger project camper, we mostly prepare simple one-pot meals for minimal cleanup and dishes. For the Mini Max, we would take this strategy to the next level. It’s amazing how much you can do with one pot. It seems unfair to criticize the available counter space in a compact camper like the Mini Max. If you’re looking to prepare large gourmet meals, you’re probably asking too much for a fully-self contained camper that can on the back of a Tacoma. On the front face of the kitchen and just under the solid surface counter top is an attractive row of switches, outlets, and monitors. 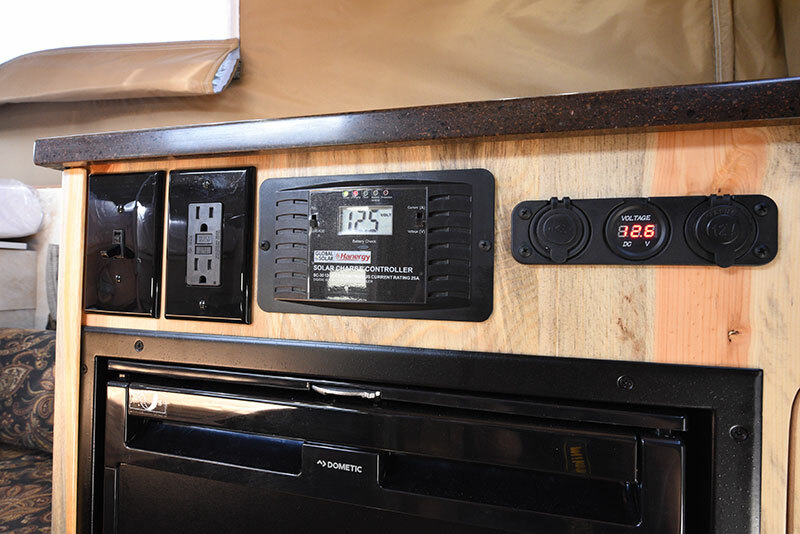 Left to right is a water pump switch, 110-volt outlet, Global Solar Hanergy solar charge controller, and combination USB-outlet, battery monitor, and 12-volt outlet. Having all this functionality in one location is great, but Mini Max owners will need to prioritize their activities. For example, it’s probably not advisable to have devices plugged in and charging – and be cooking or washing dishes. Folks will probably make dinner, clean up, and then charge their phones (or vice versa). No big deal. One useful mod that could be easily added to this area is a phone charging shelf or pocket just to the right of the combination USB-outlet and battery monitor. Most of us need to charge our smartphones daily, and a shelf or pocket in this location would be perfect. I can even see a tablet-sized cradle on the large cabinet door face. This picture was taken when the Mini Max was inside the Phoenix Campers production facility. It shows the difference between the optional Beetle Kill Pine wood in LED lighting (shown above) and the natural day light (shown below). The Beetle Kill Pine wood is still attractive in LED light, but it’s stunning in the daylight. I took this picture to show where the Suburban water heater switch is located. This switch turns on the propane water heater. The red light reminds you that it’s activated. Once fully heated, water will stay quite hot for many hours – even with the water heater turned off. If we’re off-grid, we typically turn on the water heater in the morning, shower, and then turn it off. Unless we’re camping in very cold weather, the water stays warm enough for washing hands and dishes all day. 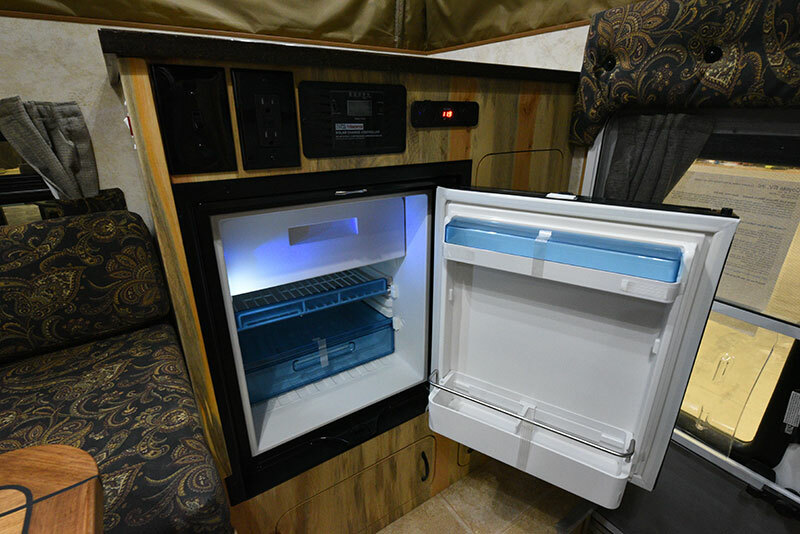 The Phoenix Mini Max features a 1.9 cubic foot Dometic CRX 65 compressor refrigerator with a Dan Foss compressor and multiple storage shelves (see below). Compressor refrigerators are well known for their incredible efficiency, non-sensitivity to being parked at angles, and nearly silent operation. For a camper like the Mini Max, the Dometic CRX 65 is a fantastic standard feature. This Dometic has a particularly neat trick up its sleeve. You can remove the freezer compartment (the top third) to create a larger refrigerator, or freezer. That’s right, you can turn the CRX 65 into a larger refrigerator or freezer depending on where you set the temperature. 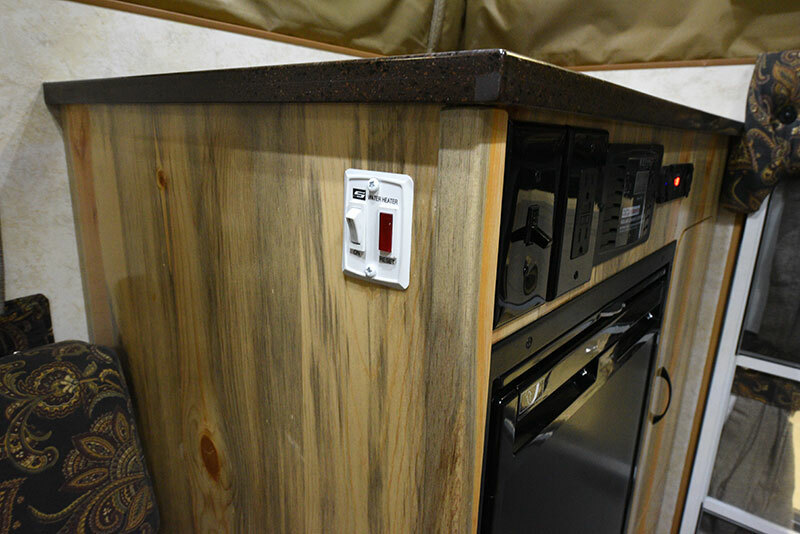 Kicking things up a notch, the temperature control panel is located inside the unit and features built-in LED lighting. It wasn’t that long ago that a small pop-up camper was limited to an ice box. Now you get a quiet and robust 12-volt compressor refrigerator/freezer with integrated LED lighting. A mini refrigerator taken to the max? You bet. 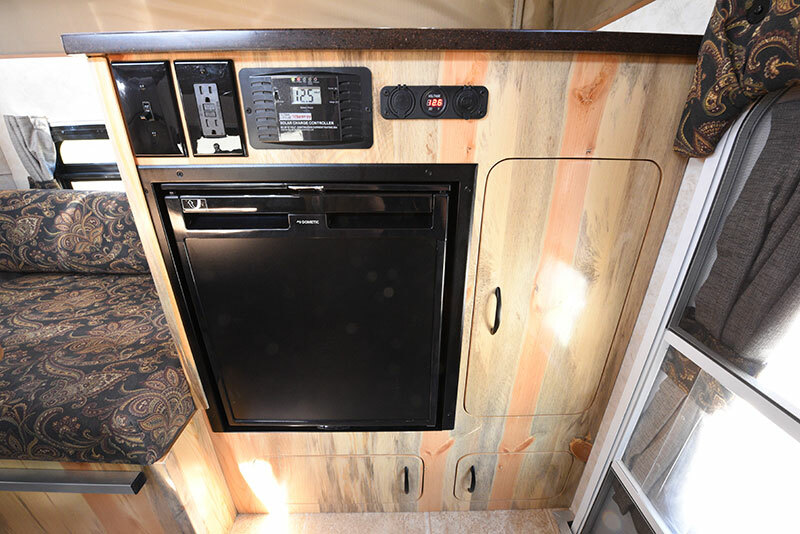 The cabinetry in the Mini Max is available in different stained woods and materials. The cabinetry in the review unit was made from Beetle Kill Pine. Throughout the Western United States and Canada, the mountain pine bark beetle has killed over 88 million acres of timber. We have driven our truck camper rig through these dead standing forests and it’s disheartening, to say the least. Fortunately, the dead pine trees can be used for wood products if they’re harvested within five years. The resulting boards retain their full structural integrity and have a fascinating natural blue stain – a direct result of the beetle infestation. The stain can appear blue, purple, brown, orange red, and even pink. Robby and Cari Rowe have used Beetle Kill Pine in a number of Phoenix builds to great effect. Not only does the use of this wood help to sequester the potential carbon release and prevent forest fires, but it looks great. We didn’t even know Beetle Kill Pine existed until Robby and Cari started using it in their campers. Well done Phoenix! 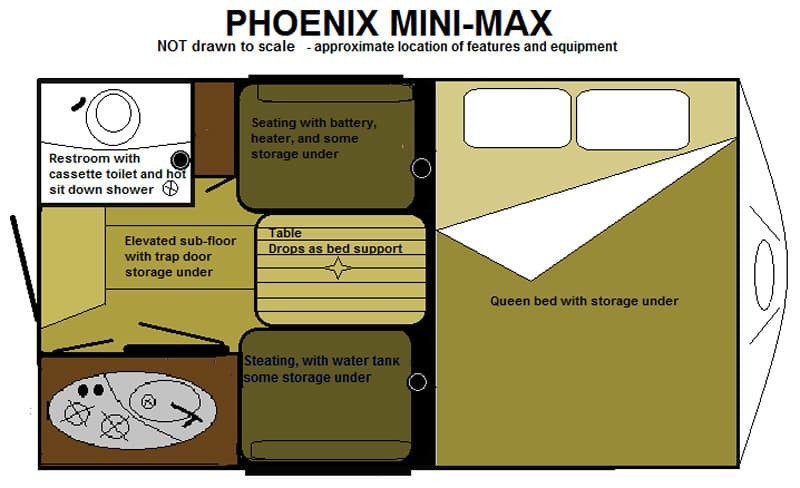 With the exception of the lift-up under bed storage area (more on this later), nobody is going to argue that the Phoenix Mini Max has tons of storage. That stated, Robby has made sure to take advantage of every possible space. The lift-up basement sets the stage, and the theme continues with the beautifully cut cabinetry in the kitchen. Where do your silverware and kitchen utensils go? 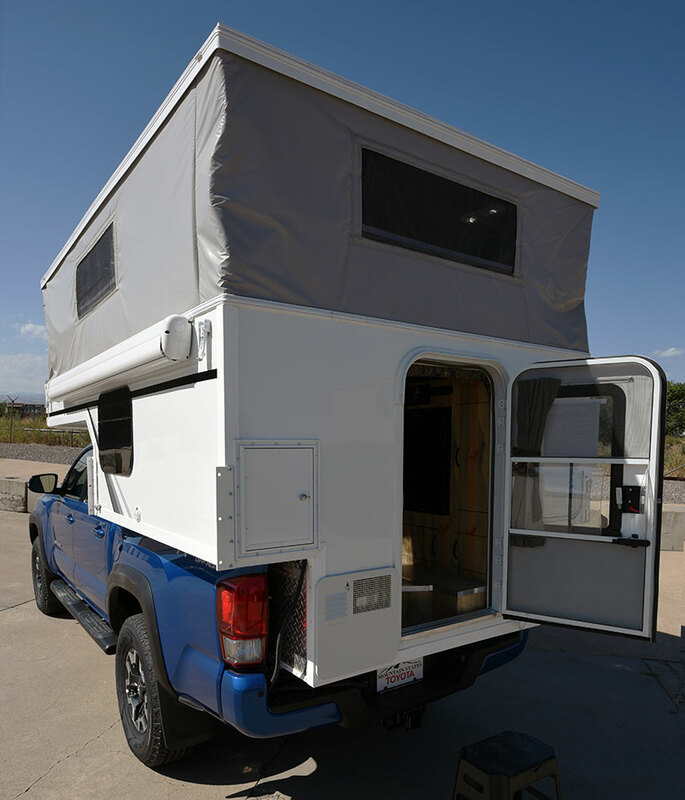 I have no idea, but thinking differently is something of a requirement for a uniquely compact camper like this.